Don’t serve me a sandwich with a fork in it. This has happened to me a number of times recently, and sooner or later I’m about to start demanding that it be served with an apology as well. Serving a sandwich with a fork in it is a naked concession of defeat. It is openly admitting that the sandwich you have served me will fall apart in my hands. “This is gonna be a mess,” it says, “you clean it up.” It’s an insult, and I’m tired of it. There are plenty of sandwiches that lose a bit or two as you eat them, but including a fork almost makes it seem like you think it’s a feature. Don’t give me a fork. Put a little effort into putting forth the best construction you can. 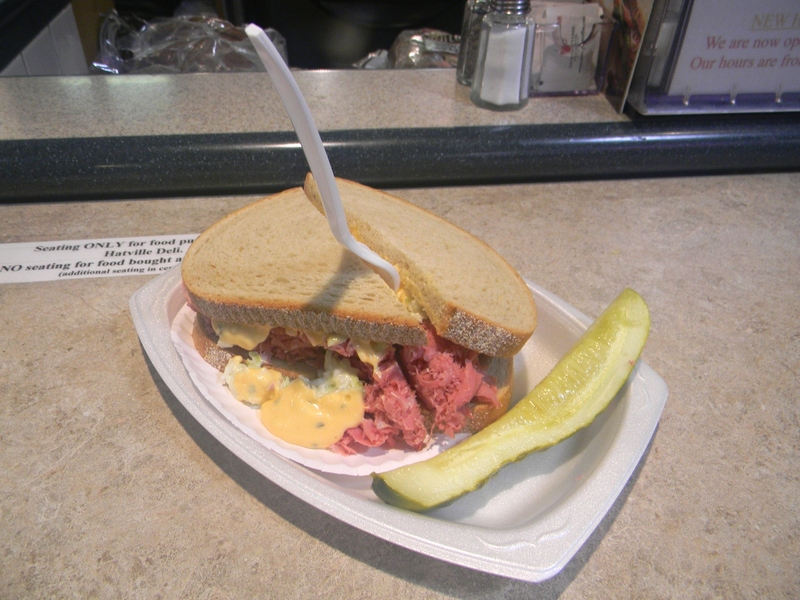 I’m going to leave aside the curious fact that the Hatville Deli, staffed by the Pennsylvania Dutch, felt the need to label the corned beef as Jewish. It’s something that doesn’t strike you at first, but a split second later earns a full “Wait, what?” I’m not sure what’s going on there, so I’ll focus on the fact that they mince it practically to dust. 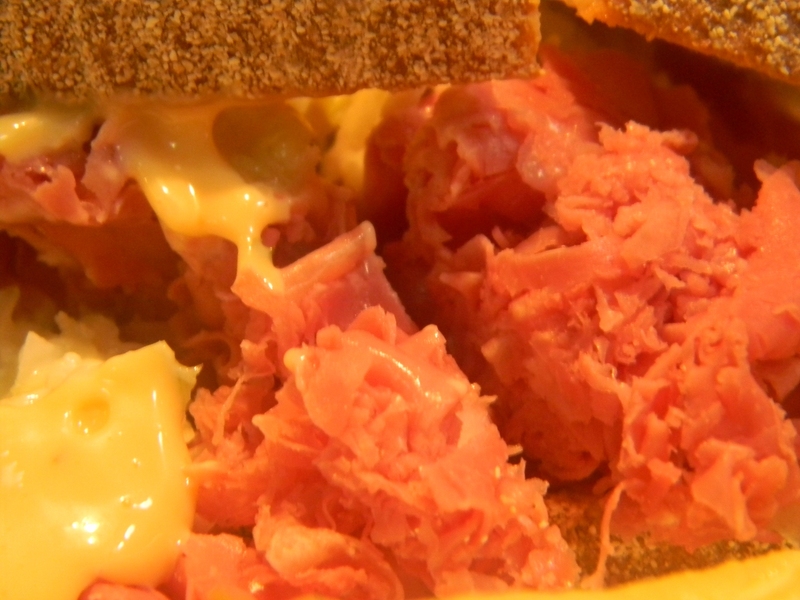 A big hunk of corned beef can easily be sliced into strips fit for a sandwich. In fact, it works like nearly every other meat. But not so at the Hatville Deli! There they prefer to completely obliterate the cut of meat, shredding it to a completely irresponsible degree and leaving you on cleanup duty. There wasn’t really anything special about the sandwich beyond that. Minced beef, Russian dressing and coleslaw all came together in a sloppy construction it somehow became my responsibility to remedy. This entry was posted in Sandwich Reviews and tagged Beef, Philadelphia, Reviews by Pete, Sandwiches I Have Eaten, Sandwiches Made For Me by Pete. Bookmark the permalink.